11) To make a bagg Pudding Take [2?] Eggs very well beaten & put to them a pint of Creame grated bread & as much flower a Little Salt & So much Suet as you please, put in nutmegg Sugar & mace then put it into a Cloath & boyle it two houres when you take it out stik it with blancht Almonds & poure over it a Little melted butter & sugar. To make a Damson white pot Take two or three manchets, cut of the crusts on both sides [illegible] crumes into thin Square peeces. Then take a deep dish round with a Laing of those Sippits: then take the marrow of 2 bones broken as you may have the marrow whole: then divide it into peeces of an jnch long and So lay on the bread a Laying of morrow, and betweene each peece of morrow a preserved damson, & So lay on the bread a Lying of marrow and damsons and your last of bread: then take a quart of creame and boyle it. 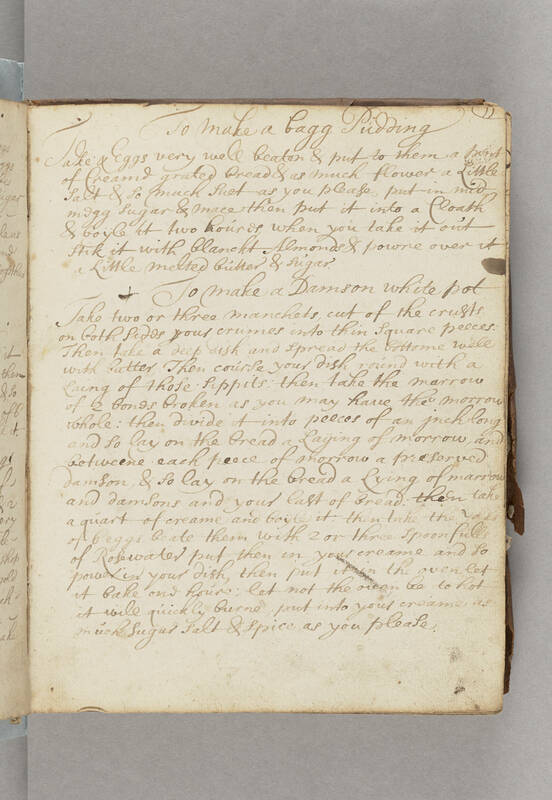 then take the yolks of 6 eggs beate them with 2 or three Spoonfulls of Rosewater put them in your creame and So power in your dish, then put it in the oven let it bake and houre: let not the oven be to hot it will quickly burne, put into your creame as much Sugar salt & Spice as you please.